Graphique Blush Marble File Folder Set – File Set Includes 9 Folders and 3 Unique"Important" Designs, Embellished w/Gold Foil on Durable Triple-Scored Coated Cardstock, 11.75" x 9.5"
Graphique Blush Marble File Folder Set – File Set Includes 9 Folders and 3 Unique''Important'' Designs, Embellished w/Gold Foil on Durable Triple-Scored Coated Cardstock, 11.75'' x 9.5'' by Graphique at Transparent University. MPN: FIF035. Hurry! Limited time offer. Offer valid only while supplies last. A matching blush marble file folder set to coordinate with your office décor are perfect for storing bills, receipts, or homework assignments. A matching blush marble file folder set to coordinate with your office décor are perfect for storing bills, receipts, or homework assignments. Including 9 folders in 3 different designs, make organization fun and easy with designer file folders. 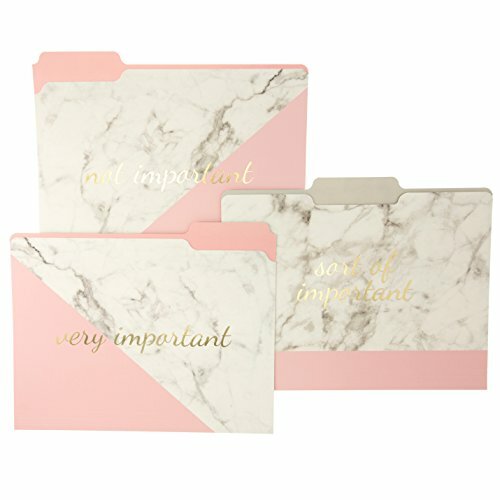 Separate your papers by their appropriate level of importance using these delightful blush and marble Graphique folders. Messages include "not important," "sort of important" and very important." This sleek set is designed to be as business-professional as it is stylish and expressive. Graphique knows what file folders are meant to be: thick and durable, made from high-quality material-these folders were made with heavy cardstock capable of handling intense, long-term use. Give your organization some flair and personality with Graphique's excellent printed designs! Each folder is triple-scored for easy expansion. This pack of folders contains nine 11.75" x 9.5" folders and 3 related designs. The tabs are very easy to write on with a pencil or pen. Decorate your home with Graphique's distinctly stylish approach to home decor, stationary, and office accessories! For thirty years Graphique has refined their products to be pure in design, long-lasting, and a delight to use.